I have a complicated relationship with Bill Maher. Back in the 1990s, I watched Politically Incorrect regularly. As a teenager, it was my exposure to ideas and arguments that I wouldn't have encountered anywhere else in the media. It wasn't just the implied freedom left-wing oppression of the show's title, but rather, the freedom from the centrist notions of political correctness, where people don't see race, the gender wars are a specific thing as opposed to a long struggle. I have encountered many politically heterodox opinions since those nights watching Comedy Central, and it would be fair to say that part of the reason I've been able to take them in stride was being exposed to a wide variety of often-leftist politically incorrect opinions on Maher's show. On the other hand, the older I've gotten, the less forgiving I've gotten of the man himself. He did have the best post 9/11 joke - “Why is it that the only person who lost their job…was me?”. Deserving props for that. But more often than not, it seems like regurgitated Daily Kos talking points combined with Maher smugly waving away audience applause for his apparent liberal leanings. The Real Time guests are also problematic. I'm fine with ideological diversity, but leaning on conventional Republican strategists or outright hacks like John Bolton doesn't, I think, give the best impression of right-wing political thought. Talking points are not the same thing as political philosophy. Although, at this point, it might be an accurate one. In the first segment, when Maher interviews journalist Dexter Filkins, some of his worst is on display. For example, Maher immediately jumps into the interview by calling Afghans “backwards”, citing Filkins' work where he says he saw an execution in a soccer stadium. 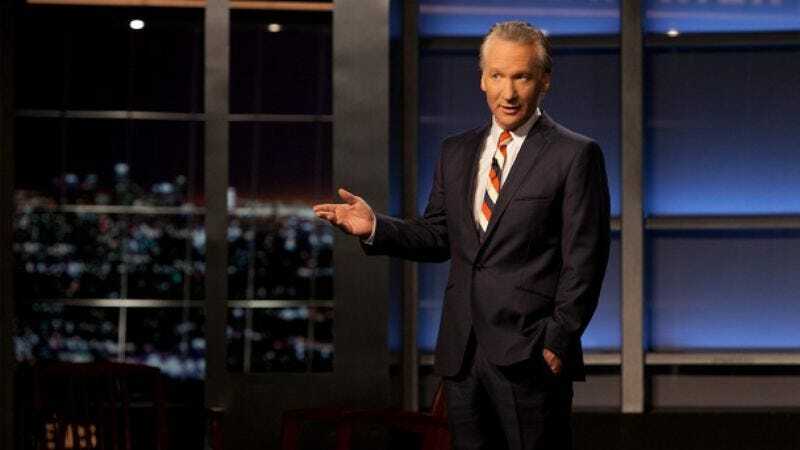 Yet just minutes before, Maher was giving his monologue on the Republican debates, and mentioned the crowd cheering at Rick Perry's statement about his proclivities in executions. Which is not to say that the two things are exactly the same, but Maher's relationship to the “War on Terror” has generally struck me as problematic. A bit later in the interview, he seems to double down, declaring that he didn't believe that the current 9/11/11 threats were valid, because of the National Security Agency, the Patriot Act even though it has problems, and…drone attacks? One of these things is not like the other! But I think part of the problem is that Maher either isn't a terribly good interviewer, or some of the people he picks for the one-on-one interviews aren't necessarily the best to work with him. Filkins isn't terrible, but it's clear that Maher has specific points he wants to make and things he wants to talk about, and Filkins isn't going to get in his way. Thus the interview becomes less about the subject, and more about the interviewer. Things get a lot better when Maher switches over the panel, where his dominance over the conversation isn't a handicap, but instead is an effective way to keep people on track. It helps that he has one of the better panels both conceptually and individually I've seen. Sometimes it's two Republicans and a journalist, in a seemingly unintentional parody of typical network media talk shows, but tonight it's relatively sane liberal Keith Olbermann, relatively sane (and surprisingly funny) conservative Rich Galen, and Jennifer Donahue, an academic analyst/centric who does manage to provide reasonably interesting criticism, although she seems a little over-trained for television. And yes, it does help that the primary subject of conversation, the Republican candidates for President, make it really easy for a critic look intelligent by poking holes in their statements. But Maher's actually damn effective at keeping the discussion entertaining, with well-placed one-liners and good comic timing. As a satirist and facilitator, I think Maher is much more effective than he is a political stand-up or interviewer. But even with a panel of a bunch of people who seem perfect for making his show work in the best way possible, it still feels like Maher doesn't quite get it. Once he engages Louis CK with the rest of the panel, the topic he wants to hit is Jackie Kennedy's recently revealed “catty” quotes about various leaders and ideas, most specifically, a bit about how she let her husband lead the way in terms of politics. While the other panelists are quick to say that 1964 was a different era with a different context, and Louis CK demonstrates hilariously and transgressively different ways to read the quotes, Maher seems fixated on his initial idea that she's a bad woman for ever expressing any notion of subservience to her husband. Likewise, his “New Rules”, the cornerstone of the show, start strong with effective visual jokes about the ridiculous corndog pictures, but quickly degrade into him and eventually Olbermann shouting at a “typical Republican voter” in a bubble. It's that kind of thing that keeps me from endorsing Real Time whole-heartedly, despite the fact that I was intelligent entertained by the majority of the show. This was a particularly good episode, compared to those I'd seen in the past, yes, thanks largely to a game group of guests. If they were all like this, I'd make Real Time “appointment television”. But there were enough demonstrations of the aspects of Maher's show that keep me at arm's length that I can't go all-in. It's complicated, yes, but that's what keeps it interesting. “They prefer to be called a faith-based lynch mob.” Maher on “Christians” cheering executions and illness. “It seemed to come and go, and I didn't see a thing, except the Clydesdales praying at Ground Zero.” - Maher on the 10th anniversary of 9/11. “Yeah, but, maybe I've been fooled too many times by you, you silver-tongued devil.” - on Obama's recent jobs speech. “Life is difficult, and it's random, and it's cruel, but I like that. I like living in that world. It's fun.” - And suddenly, Maher is overshadowed by Louis CK. “She didn't leave you, you didn't leave her. Just the thing fell on her. You're awesome.” - Louis CK on how hot widowers are. “New rule: if you don't have the sense to avoid this photo op – you can't be president.” - Maher on corndogs. Yeah. More than fair enough.